Story mode is completed in about 11 minutes. It's 11 minutes long. Do you really need to know more? The Wii is somewhat infamous for having loads of releases that are nothing more than collections of minigames with poorly implemented motion controls. Wading through the wheelbarrows full of shovelware minigame collections often seems like trying to find a needle in a haystack. Rudolph the Red-Nosed Reindeer most definitely falls on the hay side of that equation. And not much hay at that. The graphics are pretty bare bones for a Wii game. The character models are all quite basic, although the reindeer in particular do have some cute animations. The backgrounds are also quite sparse. The developers also decided to use a fake static filter over the game to make it look more like old film, but all it does is highlight how unpolished this game really is. There are a few different playable characters, but they all play identically, so it doesn't matter which you choose. 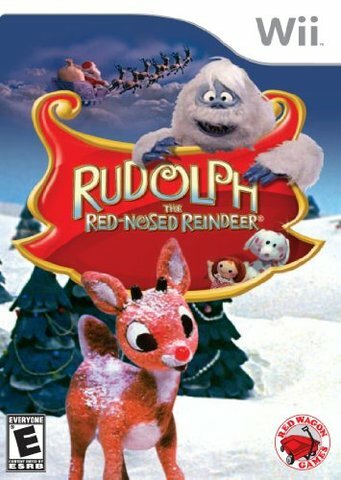 With the license of the ever popular TV special of the same name, Rudolph the Red-Nosed Reindeer has nostalgia going for it. And the music is pleasant enough. Also, you can play it one or two player. And... I'm really struggling to think of anything else nice to say about the game, so instead, I'll say three numbers. 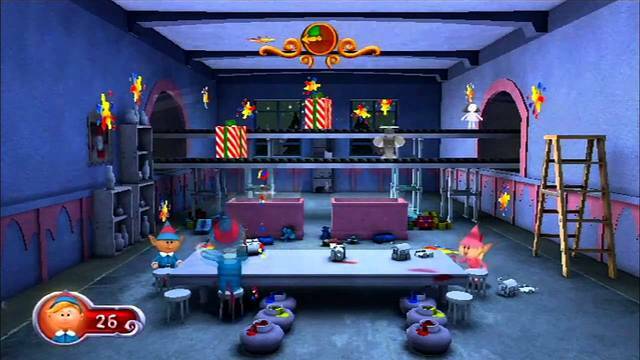 In the first game, elf will throw presents, ornaments, and lights from the top of a ladder. 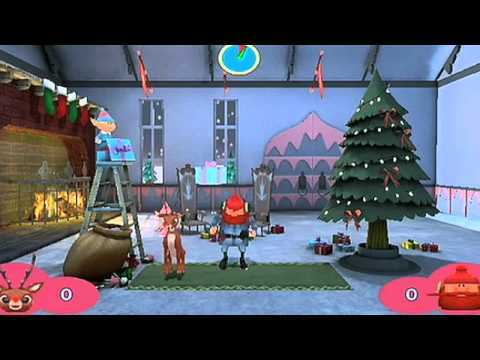 You need to tilt the Wii remote left and right to bounce the object to the tree or to Santa's bag. You can also jerk the Wii remote up or press 2 to jump, although this doesn't make much of a difference. The second game has your toys moving leisurely across the screen on conveyor belts, and you need to throw paint at them before they are wrapped. But you can only throw paint at a toy when it starts to glow. Instead of pointing your Wii remote at the toy you want to paint, you just jerk it up or down, and you'll automatically throw the paint at the right you. For the third game, you must bake cookies. Push the Wii remote back and forth like a rolling pin to roll out the dough; pump it down a few times to use the cookie cutters; swipe it to the side to slide the baking sheet into the oven; and finally wave the Wii remote in the air to apply sprinkles. The fourth and final minigame is the classic present delivery sequence. You thrust the Wii remote downward to drop a present from the sleigh as Santa and the reindeer fly over the rooftops. From start to finish, the game took me 11 minutes, 16 seconds to beat the story mode. No cheats, no glitches, no secret warps, just one play through each minigame, followed by a brief cutscene after each. The minigames are timed, and each of them goes for about two minutes. At the end, congratulations, you have saved Christmas! As you play each minigame, you will earn points every time you do something. Get an ornament to the tree? Points! Roll cookie dough? Points! Drop a present onto a chimney or rooftop? Points! The games were all pretty easy, and I wondered how many points were need to clear a minigame and move on to the next one. Borrowing a page from Luigi, I started a second playthrough of the game, and did nothing. Eleven minutes of doing nothing later, with a total of zero points, I had saved Christmas once again. I completely understand this game was targeted towards kids, but the lack of variety and shallow gameplay of the four minigames would be enough to make a kid wish he'd got a lump of coal for Christmas instead of this game. This kind of game is an insult to kids' intelligence, and part of the reason the Wii got a bad rap.